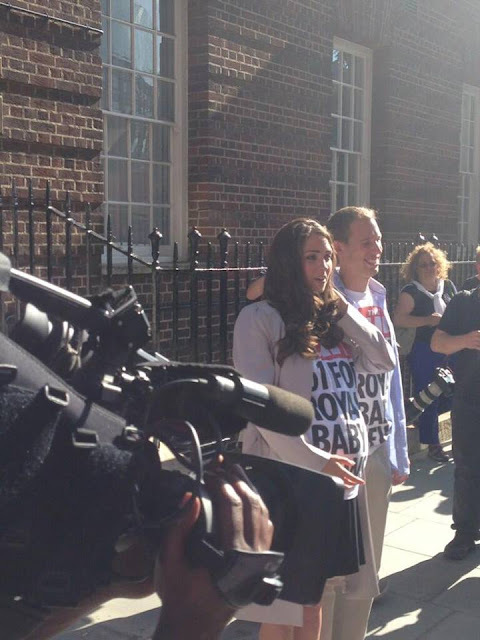 Duchess Kate: Day 19 At the Lindo Wing, Middletons Call Animal Rescue + Bubblegum Princess. Day 19 At the Lindo Wing, Middletons Call Animal Rescue + Bubblegum Princess. It's Day 19 of Royal Baby watch and what a day it's been! What a day indeed. 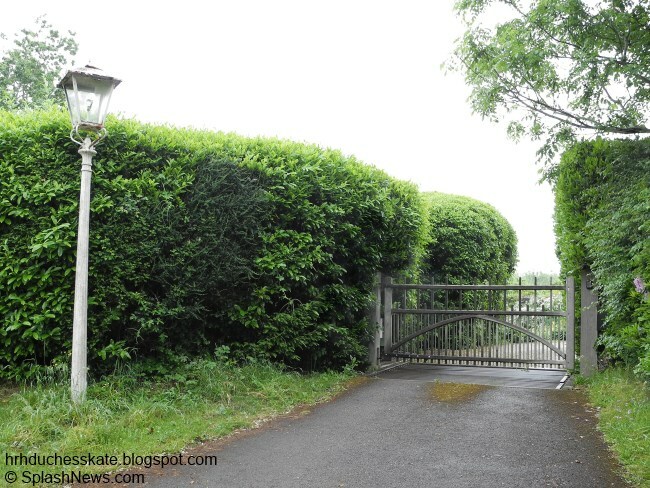 It all began this afternoon with word that William and Kate had left the Middleton home in Bucklebury, Berkshire, where they've been staying since last weekend. Reports quickly emerged that the couple, accompanied by their royal protection officers left by car en route for London. Now you can imagine what we were all desperately hoping for considering at that point! A couple of hours later a car pulled up outside St Mary's, a pregnant brunette stepped out with her partner and approached the front door prompting many to tweet, "Kate's gone in the front door" and "BREAKING NEWS: The Duchess has been admitted to St Mary's". I was interested to see what the furore was about but hadn't considered for a moment it was actually Kate (it is very, very unlikely she would use the front door, if not out of the question). Members of the media and onlookers quickly swooped in before the lady turned round and was revealed to be a lookalike hired by The Sun to promote their newspaper. The lookalikes opened their coats to reveal t-shirts with the slogan "No1 for Royal Baby News". Some found the stunt comical while others (including yours truly) felt it was in very poor taste. We all remember too well how wrong these pranks can go. Who can forget the events that occurred during Kate's stay at the King Edward VII hospital in December. 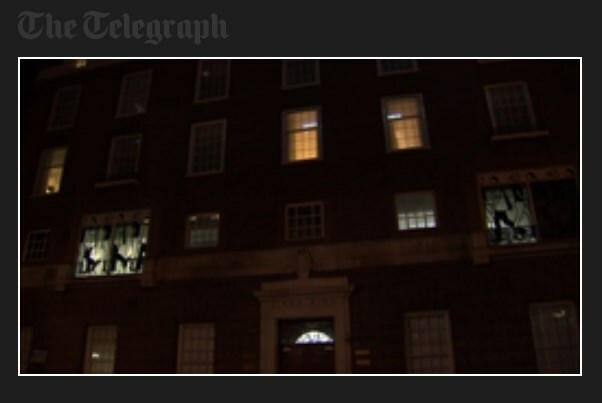 I imagine staff who were treating patients were disrupted, as were patients by the noise outside. Shortly after the hysteria calmed down at St. Mary's, The Times journalist David Brown reported armed police had in fact returned to the Middleton family home, meaning it was quite possible William and Kate just popped out for a few hours escorted by their protection officers. If you wish to keep up with all the events unfolding outside St. Mary's (Crazy Street as it's now referred to by members of the press) there are two live feeds operating: one at The Telegraph and a Reuters Live Camera. Should you see a sudden increase in police presence it is one of the first indications something is happening. In other news, Prince William is now on annual leave and won't be returning to his job as a Search and Rescue pilot at RAF Valley until after the baby is born. The Prince plans to take his two weeks statutory paternity leave. If you've been keeping up with the latest news, you'll know there's been conflicting coverage about Kate's due date. It is thought the Duchess may be overdue at this point but there has been no official word from the Palace. The other story making headlines, has been reports the Duchess plans to give birth at the Royal Berkshire Hospital; barring an emergency the plan is still for her to give birth at St Mary's. It has also emerged the emergency services were called to the Middleton family home last night and not for the reason you might think! A 999 call came to the Royal Berkshire Fire and Rescue Service in Reading just before 6pm requesting animal rescue. When they arrived they were told the dog who had got its head stuck in the gate had been freed moments later. 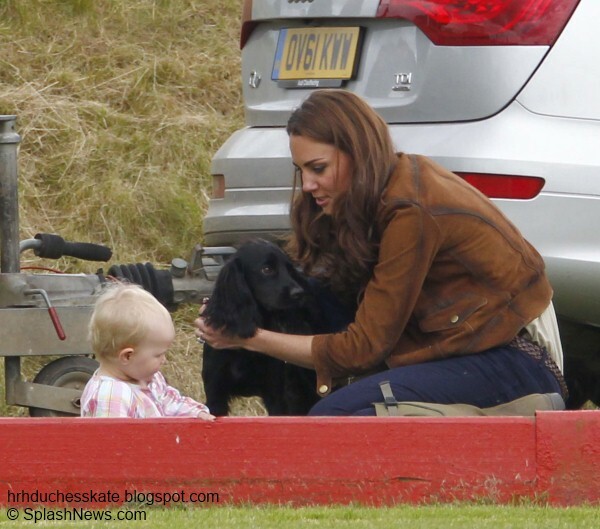 Clarence House later confirmed Lupo was not the dog involved, it must have been one of the Middleton family dogs. I had a similar experience a few years ago with one of our family dogs. It was terrible to see him in distress and so challenging to free him without hurting him. Next we share news about a new children's book inspired by William and Kate's romance which may be of interest to the parents among you! 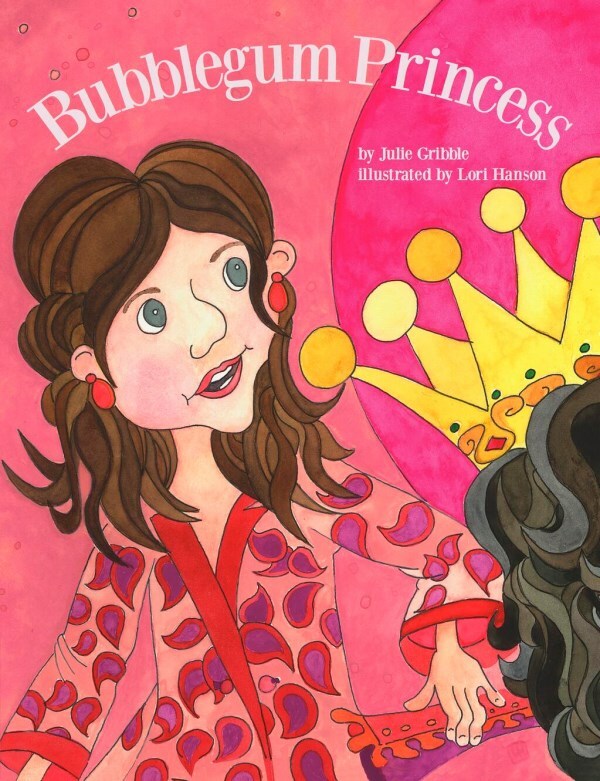 Bubblegum Princess author Julie Gribble used a real life chewing gum incident which took place at William's passing out ceremony at Sandhurst as inspiration for the book. The book will go on sale the day Baby Cambridge is born and features illustrations by California-based painter Lori Hanson. The publishers NY Media Works have kindly donated copies to all of East Anglia's Children's Hospices, for which we send our sincerest thanks. Children do so enjoy colourful books and girls do so enjoy reading about Princesses :) To find out more the official website is here. Thank you for another great post, Charlotte! I definitely agree with you re: the stunt pulled by the Sun. It showed extremely poor taste to disrupt the people both inside and out of the hospital. I can't imagine that it did much for the Sun's reputation and credibility either. Poor Lupo! Hope all is well with him tonight. The Cambridges don't need the added stress of an injured pet right now. I really cannot believe that even after the incident with that poor nurse last year, someone still thought it was "funny" to play another hospital-related prank. You would really think that these people would have learned their lessons when a life was lost! I guess they're referring to that time Carole was spotted chewing nicotine gum during a ceremony. In 2006, Carole Middleton, Kate's mom, was chewing gum at William's Passing Out Parade for his graduation from the Royal Military Academy Sandhurst. The media had a field day with this pointing out how one does not chew gum at a formal AND royal event. She chewed the gum discreetly--she may have chewed it to freshen her breath or calm her nerves. But... one of the TV cameras zoomed in on Carole and stayed on her, which was rather unprofessional of the news crew. It was, indeed, nicotine gum. She was trying to quit smoking. Yes! That's the incident that inspired the story. It was so silly for the media to get into such a state over it - they blew it out of proportion! The Sun's stunt was despicable--and, yes, I will stick by my word--despicable! The scene at this hospital has become a circus...there are other patients seriously ill there and I am surprised the police have allowed to to get to this point! I hope W&K pull a fast one and have the baby by her parents...I wouldn't blame them! What is sad is that the same type of frenzy surrounded Diana. Kinda scary. Don't think she is in labour and they deserve their privacy. Perhaps if the palace released an honest statement just maybe this frenzy will die down. It is getting way too scary. I too am excited but this level of insanity is going too far. The Palace isn't being dishonest, simply vague, no doubt that's to protect the Cambridges' privacy. Also no doubt if they named the day and hour, it would not cool the media frenzy at all. Sun stunt is vile, considering how the last stupid media prank ended. Thinking the Duchess will be forced to slip in riding in a tradesmen's van. I don't agree that if the Palace would release an honest statement that it could help this frenzy. I think it would casue a bigger one. And William & his Duchess deserve their privacy during this time. The media will get their pictures when the baby is born and they leave the hospital. They will not get any pictures of the Duchcess going into the hospital, they will be entering thru a private enterance. Even if the Palace gave a date it does not mean the bay woould come on tht date. So the media people need to just chill out until the royal birth. The Telegraph has updated their dog rescue story with Clarence House confirming Lupo was not involved. Thank you again for this great post. I am with you that what this couple did was in very poor taste. People will do whatever to get their 10 minutes of fame and not think aobut other people. And the Suns should be ashamed of it self but I doubt they are. I bet William & his duchess went into London for a doctor check up at the hospital. It is nice to hear that William is on annual leave and does not have to hurry back to his job. And that he still will get his 2 weeks paternity leave once Baby C comes. and I am getting tired of reading (not here)that people are feeling sorry for all the media that have been camped out now for 19 days. It is there own faults that they elected to start to camp out at the beginning of July. All that was said before this was the Duchess's due date was in mid July. With a first time baby it is usually late. And I don't blame William or the Palace for not giving the exact date, just think what it would be like outside of the hospital. This is typical William. He want's privacy for his Duchess and himself and I don't blame him. This is a very personal time for them. They will share the baby once it is born and they leave the hospital. And they will not be arriving on teh frist steps of the hospital when she goes into labor. That is very dumb to think that. I really think it would be better if we didn't see them appear on the steps. It would stop all this frenzy and disruption for the other patients. They ought to have their babies in the palace as b4. I totally agree with every thing you said Pauline! Hi Charlotte, I guess the media did not learn their lesson about doing a prank in front of a hospital where there are very Ill patients inside. I hope the Sun gets slapped with a big fine there is no excuse to do something like this. I pray that William and Kate can have a wonderful birth experience. Happy healthy baby soon!!!! Hello Charlotte and DK community! This is all pretty exciting! After all, we are witnessing a very historic event. The baby will come soon enough and many around the world will celebrate his or her arrival. But let us remember that not every child is received into this world with such pomp and circumstance. Even though every child is special and deserving of a wonderful start in life. I appreciate that this blog also highlights the various charities and organizations making a difference in the life of disadvantaged children not just what the Duchess chooses to wear for the day. I agree! It is great that you always pay special attention to the charities that Kate is supporting, Charlotte. I would like to add how much I appreciate the fact that you pay so much attention to what you write. Your posts are always impeccably tasteful and so very considerate. Large parts of the press could learn a great deal from you! Thank you so much! Learning about charitable organisations across the UK and researching them has been so insightful for me, it's incredible the difference a royal patronage makes to them in terms of fundraising and public awareness, so I think it's so important for anyone writing about the royals to highlight that wherever possible. Thanks for the update Charlotte! Well, certainly is buzzing around London! I have to agree with everyone else that the Sun's "prank" was in poor taste. In light of what happened back at the beginning of Kate's pregnancy after her hospital stay, they should know better. It's also so disrespectful to the other patients there. Shame on them. That being said, I couldn't believe how much the girl looked like Kate at first glance. I agree with you dear Charlotte. This is in extremely poor taste. I am glad lupo and the little dog affected in such a painful way is ok now. How scary and painful for the little dog. I didn't think that joke was funny either. One could think that maybe people have had their lesson learned considering what happened last December. But I guess they have not. I definetely wouldn't want to be a patient recovering there. I don't know how someone can rest with that circus happening outside their window. I know the journalists are just doing their jobs, but can't help my feelings for the patients. I'm glad the dog is fine! This is such a loving animal! My dog always enters places she can't get out of because apparently she is afraid of heights. It's kinda funny! But I'm glad we've always been able to "rescue" her! As a curiousity, I'd like to share with you that "Lindo" (for Lindo Wing) means beautiful in my language, Portuguese. I think is great name! Well, I hope you can enjoy a lovely weekend. And to Charlotte, thank you for this post and for the coverage as always. I will always be grateful to you for all the work and time you have put on this blog so you can keep us posted. Thank you, thank you! Hello Ana B! Thank you for letting us know the meaning of Lindo in Portugese, ;-)greetings from a very hot DC! My pleasure, Siddhii! I'm always really, really curious about different cultures! I find it fascinating, to be honest! I would love to learn more from India someday! I've heard temperatures are very high around NY and DC area! I hope your fine! Thanks again charlotte.lovely post as usual. I just hope with people pulling crazy stunts like the Daily Sun did, that the Cambridges make it to the hospital without any hinderance. That's all that matters now, the safety of Kate n her precious bundle. Another great wait kate day ladies lol:) have a great day all. From kushy in a cold n rainy South Africa. must have nerves of steel! That would be a lot to handle for any normal human being. Charlotte, thanks for keeping us updated in such a friendly, level headed style! It is these press people who will give us the first glimpse of our new heir. ( & perhaps only) without them there it would be blackout. Thanks for another wonderful post! :) I do hope this weekend will be the end of the waiting game. I'm glad it wasn't Lupo, but I'm sure it was equally distressing for all concerned. I agree that the Sun's stunt was in very poor taste. But I must say that when I've taken a look at the live coverage outside of the hospital, it's pretty calm and not at all noisy (I believe audio coverage is included). They're just waiting and passing the time as best they can. And Pauline, I don't think the members of the press have a choice about when they start covering this type of story. Whether we had an "exact" date or not, July coverage was a done deal. They don't want to take a chance on missing anything. I still think that camping out in front of the hospital is not only disrupting the patients and employees of the hospital, but is also unnecessary. As far as I have understood, the palace will issue a statement when Kate is in labour. Since they certainly will not leave the hospital immediately after the birth, there is PLENTY of time for the media to get there. Also, they can't be actually hoping to see her enter the hospital, can they? Kate will not be entering the hospital through the front entrance. No one in her situation would. Hence: all of this frenzy doesn't lead to anything. Day 20 at the Lindo Wing and all is very quiet! rumor has it that Grandmother to Be Mrs. Middleton said the baby was going to be a Leo. That would mean due date as sometimes reported July 23rd or later. I don't know how the UK does it, I did Labor and Delivery Nursing for ten years in the US. Rarely did they let a baby go overdue for more than a week with out an induction. That week after EDD usually includes biweekly visits to the MD or the outpatient part of the L&D, to monitor the fetus by doing Fetal Stress Tests, checking moms Blood Pressure, measuring the amniotic fluid..etc. So I am leaning towards that the actual due date is later than reported. At the moment I believe July 19th was probably the date. Fits perfectly to Camillas "by the end of the week" comment. That the baby will be a leo was probably Caroles prediction, and she might be right! I'm hoping for tomorrow. Maybe she goes into labor tonight? With the media being that crazy about Kates pregnancy, I really doubt that Kate announced an earlier due date. Wouldn't make much sense? Unless, the EDD changed during the course of the first 20 weeks. Which has been known to happen, after series of Ultrasounds to measure the baby. It could have initially been July 12th but changed to a week or so later. Happened with my eldest. Original EDD was 12/13 and was changed to 12/25 after US measurements.. Right, good reason and definitely possible. We will never find out. While the joke wasn't in the best taste, I don't see that it's all that bad. No invasion of privacy or involvement of hospital staff which is what made the other so serious. That girl does look a lot like Kate! Frist babies are often late. Doubt that palace would be intentionally deceptive on the late end as it just ups the frenzy. Kate didn't look all that huge in June so I was suspecting it was going to be later in July. Looks like it will be a Leo as Carole hinted after all. As people here sometimes make suggestions as to what you could cover in the future, I would like to make a suggestion as well. Since this is the heir to the British throne that is about to be born, how about a post about her/ his ancestors, the previous kings and queens? I know that this is a blog about Kate and this may not relate to her directly, but since she did marry into the Windsor family and her baby is going to be the heir... you see the connection? ;) Also, when the name of the baby is announced, some information about previous Royals with that name could perhaps be interesting. This is just a suggestion, so if you don't think it's a good idea, that's fine with me. I just happen to love British (Royal) History and enjoyed it tremendously whenever you included it in a post . Excellent idea, I've done a couple of royal history posts mostly related to the history of titles and I found it hugely enjoyable. Day 20 of Baby Watch, Great Kate Wait, media frenzy, etc. and all is quiet outside the Lindo Wing. There are some silly people hanging out on the steps, but no Baby C. I will admit I was up at 2:30 this morning checking to see if any news had broken. Surely soon, surely. Sleep well, Kate! Not too much longer!!! Wouldn't it be a huge surprise if the baby turned out to be twins?! Trying to wrap my head around Kate being out of sight for quite sometime now. Twins would be a bombshell of epic proportions! One thing the Palace did announce for sure is that this is a single child, not twins. Sorry! Watching CNN special Will and Kate Plus 1. They are re-using a lot of footage from the pre-wedding specials. Same interviews. I don't think there's been five minutes of fresh material so far and it's only got about ten minutes yet to run. Typical CNN. That would be something! :) But I think Kate was too small throughout her pregnancy for that. I am not so sure the Palace would make an announcement about twins (in general). If something happened to one of the babies during the pregnancy, there would be no reason for the whole world to know. IMO. Royalfan, I agree that Kate was too small for twins. Added to that is the fact that twins rarely make it to term--and the mother is often put to bed during the last six weeks or so in hopes of her carrying to term. We have had none of those indications. So I think this is definitely a singleton! But, boy, was I ever wrong about the birth date! So I'm not a very reliable voice. My dear friends, I'm here to share with you my excitement! A big fast fashion store here in Brazil just released a great collection by Issa London! I went crazy over the dresses! Bought 2 of them and maybe tomorrow I'll buy more! And they look just like the ones Catherine used to dress before the engagement! Remember the pink one with an enormous cleavage she wore to the Boodles Boxing Ball in 2008? They have it and it looks amazing and it dresses perfectly! The best thing is that the pieces are so cheap comparing to their real prices! I'm just too excited right now! A nice sunday to you all! There's nothing like retail therapy for a gal. :) I can feel your excitement! Ana B., I think you've mentioned before that you are tall. I'll bet you are also slender--and that you look absolutely awesome in those Issa dresses! I am way past Issa (too fat, too short, too old), but I have a tall, slender daughter, and I wish I could find them in the US for her! Thank you for this awesome blog/page where we in the USA can share in this celebration. I, too agree that the due date had to have been later than media reported. Working in the medical profession I would not think they would allow a 8 day overdue unless the original date was incorrect and professionals want to ensure as such. I am hoping everything is okay for them. Family that is on assignment in London informed us the atmosphere in the area is very much a frenzy in the areas near hospital to the point of a safety concern. I will date myself but being near the age of Diana I seen the chaos surrounding her first birth but this is far more vast to the point of anyone having paid attention to Diana's experience could find this scenario even more frightening of the fascination with this couple. I don't think Willliam is an advocate of the media and they are very much a modern couple so I would not at all be surprised if we just get word the baby was born and they never show up at this hospital. After watching the insanity would you? I will say that I think if a girl Elizabeth will be one of the names. Word is no Diana name...a little sad. I think Phillip, Charles or even Michael will be included as one of the names. And on a final note I will think we have at least 3 days yet before any development. And while I feel for this couple and William was born into the life, Kate also knew the deal and the eyes of the world on her so she should be as graceful ad always. In the uk they let you go 14 days over your due date b4 inducing. Still only once a week check ups at that point. Sue. Woking. I agree that Elizabeth is very, very likely to be included. I even think that it would make a lovely first name, but on the other hand it would certainly invite comparison, which might not be so great for a future monarch. After all, everyone would probably want to have a name in her/ his own right. Personally, I'd prefer Charlotte, Alice or Victoria. I think they'll have a girl (just a feeling ;) which is why I've thought more about girls' names, but maybe George for a boy? The original "due date" was generated by the media. The palace never confirmed any date. Carole Middleton has reportedly said this baby will be a Leo. Maybe she knows more than we do. The longer this goes on, the more I'm hoping this "bundle of joy" will be born on the 24th... my birthday! LOL! When William was playing polo last weekend should have been a indication to everyone that the date was much later than we were being told. The Palace confirmed the Duchess was due in "mid-July". It seems to be very much thought Kate is now overdue. There were reports saying that members of staff at the hospital were being told that her due date was July 19th. That might just as well be true. I remember thinking the baby might share a birthday with Diana, how off was that? :) I'm sure it isn't long now! Are you all having a good weekend? I think we're now in Leo, aren't we? So Carole is already right! Well, Charlotte....I may need to change my vote for the gender of the baby! I chose "girl" for the poll, but with the baby now being overdue, I'm thinking I may have to go with a "boy" vote now! :) I was 10 days overdue with my first baby, a boy, which seems to be the case with a lot of first time mothers of boys. I'm hoping that Catherine is doing well in these, which HAVE to be (! ), the final days of her pregnancy - hoping that all the media craziness isn't making her feel too pressured or miserable. I remember each and every one of those 10 days that I was overdue, and each day began with tears, and that was without the added pressures that Catherine has to deal with! Thanks for keeping us updated, Charlotte! I continue to be on pins and needles just waiting for your blog post, letting us know that the baby has finally been born. Yes I was 4days over for my son, but I'm wishing for a princess. Have spent a wonderful weekend with hubby down in Big Sur Calif. along the coast. Feeling a little , mind you a little guilty for not stressing away with my dear blogger friends. God bless Kate , Will , BC and all my dear friends here. By the way the Calif. coast is a must see for all of our international friends. Cheers for a healthy hearty birth . Go for it, Ana B! It's a good way to pass the time until we get royal news. Kate would approve of shopping! People here aren't very interested in BRF or Catherine especifically, so none could understand my excitement! I'm glad I could share this with you ladies! Just keep praying daily for a safe easy delivery for the Duchess. I want to see pics of this baby but I wish the press would go home and let them post a few pics of their choosing. Birth is emotional and stressful enough. It's hard to find a happy medium when you are not only a future monarch but the son of one of the most famous women in the world. I say and rocked my second newborn son as I watched Diana's funeral. This may sound goofy but in that emotional post partum state I vowed to pray for her boys and I have.